A typical Tuesday night peer support meeting at Valleyview Residence. Have you recently been diagnosed with prostate cancer? Are you in the process of exploring your treatment options? Have you had treatment and now are dealing with side effects? Are you a prostate cancer survivor willing to share your experience? Attend one of our peer support meetings! Among the attendees will usually be someone who has had the treatment(s) you are considering or dealt with the side effects you are experiencing. PCCN-Toronto Peer Support Meetings – 7 p.m. to 9 p.m. These meetings are held on the FIRST and THIRD Tuesday evenings of each month except on statutory holidays, at Valleyview Residence, 541 Finch Ave West, (Immediately east of North York General Hospital’s Branson site),Toronto, Ontario, M2R 3Y3, Phone 416-398-0555. See the map below. 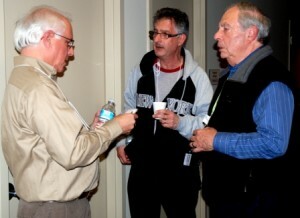 Our meetings provide an opportunity for you to talk in complete confidence with prostate cancer survivors. These meetings draw 30 to 40. There is usually someone there who has had the treatment you are considering. This gives you an opportunity to talk directly to the men who’ve been through the various treatments. 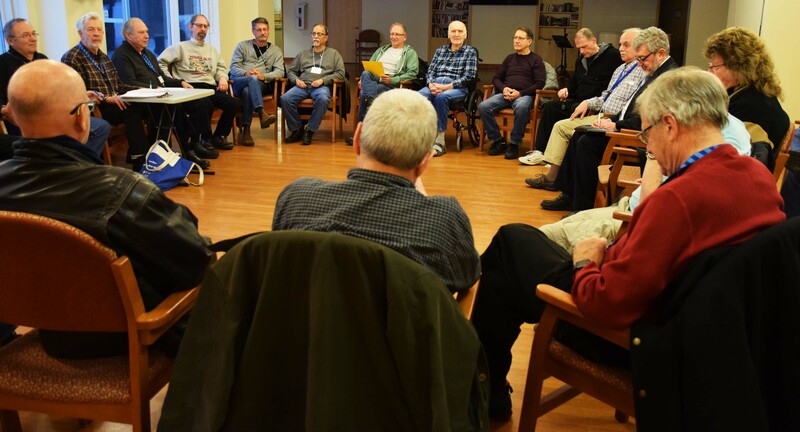 Our meetings provide an opportunity to come together to talk with others about managing life with prostate cancer. Parking is FREE and there is a refreshment break, during which time you will have the opportunity to talk “one on one” with anyone you choose. Note: we cannot give medical advice, but can share our knowledge of treatments and experiences. Because diagnosis of prostate cancer can affect the entire family, special peer support and advice is available to spouses/partners and caregivers by our female volunteers. This is now BY APPOINTMENT ONLY. Call our support line, (416)932-8840 or email info@pccntoronto.ca. You can converse with our Side by Side volunteers (spouses and partners of survivors) over the telephone or possibly in person at a mutually agreed upon time and place. On the first Tuesday evening of each month (statutory holidays excepted), the Valleyview Residence Board room is available at the same time as men’s meeting, if that is what is what can be agreed on. See the map below. There are also 2 subgroup meetings that alternate on third Tuesday: Warriors, dealing with more advanced prostate cancer, and the Emotional Support Group, for men and women needing more emotional, as opposed to more medical type, support. 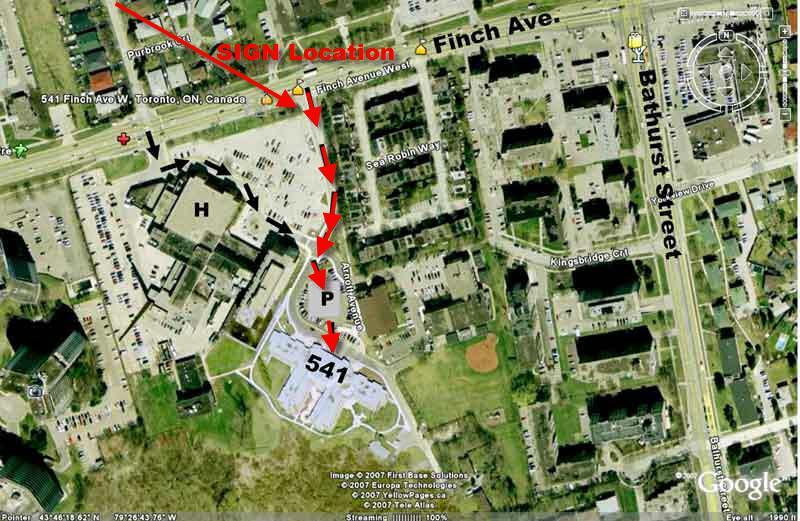 If driving: Turn south off Finch when you see this sign, first parking lot on the left, behind and east of the hospital. Parking is free (in spite of what it might say on the pay station). 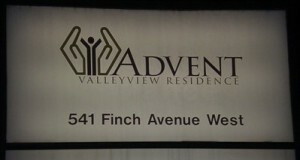 If taking the TTC: Take Finch West bus (#36) one stop west of Bathurst at 550 Finch Ave. W. where you’ll see this sign on the south side of the street. (It’s also a short walk from Bathurst and Finch if taking the Bathurst bus (#7) ).